We found Akram sprawled helplessly on a makeshift wooden bed in a village mosque in southern Thailand. His teenage body was malnourished and covered with fly-blown pressure sores. His breathing was rapid and shallow, and he gasped for breath as he told his story. Akram was one of about 25 Rohingya Muslims rescued from a nearby human-smuggling camp sixteen days before. I counted six young men who moved through the mosque’s grounds with the help of wheelchairs, walking frames or crutches. At the camp, Akram had been beaten, starved and left for dead. Yet what he had endured was unremarkable by the standards of his long-suffering people. The Rohingya are mostly stateless residents of Rakhine State in western Myanmar. Apartheid-like conditions there have compelled tens of thousands of them to cross the Bay of Bengal in smugglers’ boats bound for – they hope – Malaysia. But the boats come ashore in Thailand, where the Rohingya are held at secret camps until relatives pay for their onward passage to Malaysia. It is effectively a vast kidnap-and-ransom operation. Akram, then 17, ended up at an overcrowded camp in a deserted rubber plantation near the Malaysian border. By day, the guards forced the Rohingya to squat on their haunches; by night, to lie in a foetal position. If they moved, even to stretch, they were beaten. After a month locked in these stress positions and weakened by chronic diarrhoea, Akram was paralysed. He suffered two more months of this torture. Then the guards heard a rumour of a police raid, and fled along with the Rohingya who could walk. The others crawled through the rubber trees until local Muslims found them. 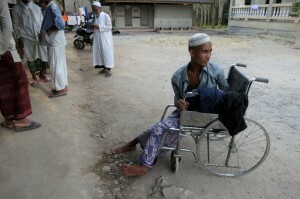 Fourteen Rohingya were now recuperating at the mosque. Three were at a nearby hospital. Three had died. The rest had been spirited away by relatives. The local Muslims had saved many Rohingya lives, but you had to wonder how much they knew about other camps in their area – probably more than they dared to say. “There are many camps in these hills,” said Akram’s friend Yasin, 17, who had escaped the same camp. Akram’s muscles were so atrophied he still couldn’t stand up, but Yasin seemed in better shape. Before leaving the mosque, I saw him riding carefully around the grounds on a borrowed mountain bike. He was smiling. Then he got off the bike and his legs crumpled beneath him.